Earlier this month, the Environmental Working Group — the D.C.-based nonprofit that helps the green-conscious decide which sunscreen to wear and what to wash their dishes with — was rallying California followers to contact state legislators in support of a bill to regulate fracking. The sun was about to set on California’s 2012-2013 legislative session without a single new law on the issue, despite an industry poised for potential boom on the Monterey Shale — 1,750 square miles that extend from Central to Southern California containing two-thirds of the country’s estimated shale reserves. Two proposed bills had already died; one that would have imposed a moratorium on hydraulic fracturing got just 24 votes in the 80-member Assembly. Only Senate Bill 4 still had a chance; it had cleared the Senate and was headed for the Assembly. And though some moratorium-or-bust environmentalists thought the bill didn’t go far enough, EWG — whose staff had worked for four years on the legislation — remained ardently behind it. Plus, the bill had been authored by none other than State Senator Fran Pavley, the legislator who, while in the Assembly, wrote two of California’s landmark climate laws: One, in 2001, to set stringent emissions standards for cars and trucks and another, the iconic AB 32, to reduce greenhouse gases coming out of everything else. The Democrat from the north coast of Los Angeles County has a knack for realpolitik advances in environmental lawmaking; a bill with her name on it typically gets rubber-stamped with the environmental community’s blessing. Water tanks preparing for a hydraulic fracturing job. Photo by Joshua Doubek. Less than a week later, however, everything had changed. SB 4 had gone into the Assembly and, under pressure from both the oil and gas industry and Governor Jerry Brown, it came out an altered beast, apparently with a two-year grace period for any kind of wild well stimulation the oil and gas industry deemed necessary to force hard-to-access heavy oil from the Monterey Shale’s deep Miocene rock. By the time the amended bill went back to the Senate on September 11, EWG had withdrawn its support, as had every other environmental group that had backed it before. Pavley was now the proud sponsor of a fracking bill that every last environmentalist, save the ones in the Democrat-dominated legislature, hated. But at least it was one that the Governor was likely to sign. EWG’s man up at the California Capitol in Sacramento, Bill Allayaud, says that while the Western States Petroleum Association — the state’s busiest lobbyist in 2012 — was always gunning for the bill (“they wanted to bust it open,” he says), lobbying activity picked up last summer when Pavley got wise to industry techniques and expanded it to include acid jobs.“ That struck a nerve,” says Allayaud, whose organization pointed out, in 2011, that neither fracking nor acidizing is a new thing in California. “It turns out that some companies have been acidizing wells like crazy,” Allayud says. They’ve been fracking, too, with little oversight and even fewer rules. In 2011, EWG went to the state’s regulatory authority, the Division of Oil, Gas and Geothermal Resources (DOGGR), and said, “Tell us where a well was fracked. Tell us when a well failed.” DOGGR — which everyone pronounces “dogger” — “could not do that,” Allayaud says. He points to Jeremy Miller’s 2010 reporting in HCN as a demonstration of the data gaps. “Jeremy asked where does the water go, and where does it come from (in fracking operations)? He got pretty far, but it’s hard to go further, because the data doesn’t exist.” Pavley’s bill was crafted to make sure that in the future, regulators could answer those questions, and many more — including exactly what chemical brews were being used in the process. And some of that good stuff remains. “The bill still has powerful components that make it the strongest fracking bill in the nation,” Allayaud says. “It requires public disclosure of trade secrets. 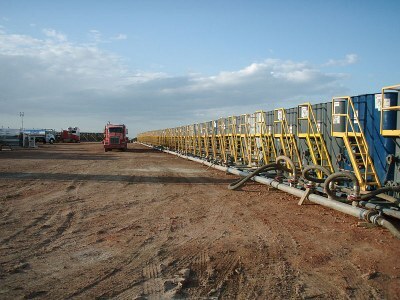 It requires groundwater monitoring before and after both acid and frack jobs. It really does prevent DOGGR from being too tied to the industry; it forces them to represent the public and not just Chevron and Occidental.” It still calls for a comprehensive environmental review of well stimulation treatments by 2015, and the issuance of final regulations when that study’s done. But now there's also a fuzzy line stating that DOGGR “shall allow” fracking and acidizing until it issues final regulations in 2015, which depending on your interpretation may or may not mean that, for the next two years, oil and gas producers can proceed as usual. “We thought it was potentially damaging enough that we wanted to send a message that we’re not happy,” Allayaud says. The Governor, on the other hand, is plenty happy. And Pavley is making the rounds with reporters defending a bill that, while far from perfect, at least brings into the open what’s been happening under the radar: "Without SB 4, there will be no public disclosure of chemicals, no groundwater monitoring and no regulation of acidizing, and the oil companies will continue to be able to frack without a permit or any public accountability whatsoever," she told E&E Energy Wire. "The world won't be perfect" because of SB 4, "but it will be a whole lot better." Judith Lewis Mernit is a contributing editor of High Country News.